Please note that this current website does not have a shopping cart. 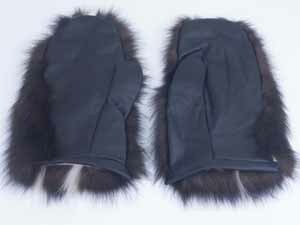 To buy our Skunk Gloves online, please go to our e-commerce website at NaturalExotics.ca. 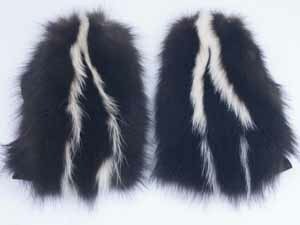 This is a pair of skunk fur gloves with black leather palms. The type of leather is either horse or deer. It comes in one size. Men and women can wear these gloves. The gloves feel great and keep your hands warm. The gloves are approximately 26.5 cm (10.4") long by 12.5 cm (4.9") wide. Each pair of gloves weigh approximately 0.34 pounds.